An insulated beaker of hot water is connected to a beaker of cold water with a conducting bar, and over time the temperatures of the beakers equalize as heat is transferred through the bar. Four materials (aluminum, copper, steel, and glass) are available for the bar. The focus of conduction is straightforward in this gizmo; however, the lesson resource guides students th... (more)rough five tasks: running and recording gizmo data, setting up an Excel spreadsheet, exporting gizmo data, interpreting graphs, and making contrasts and copying-pasting graphs into Excel. Using the Heat Transfer by Conduction Gizmo, students will investigate, understand and justify how heat t... (more)ransferred by conduction is related to the laws of thermodynamics! 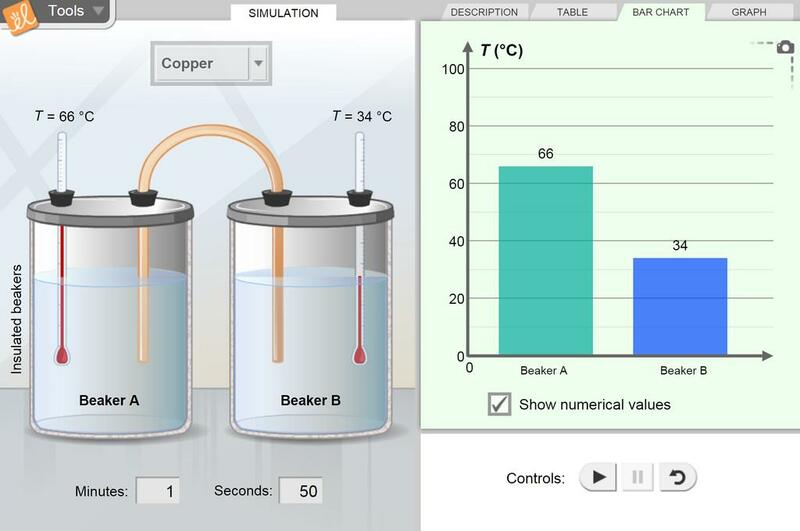 Also included, an inexpensive, simple classroom lab activity to follow up the simulation is included. This is an opportunity for students to use the snapshot tool to present their findings and support their ... (more)investigation. my students enjoyed this gizmo, for them the gizmo allowed them to not only learn at their level, but to participate in their own learning. Relates to experimental method and ties in conductivity and heat transfer. Great gizmo!